In general, I’ve stayed away from protein bars because 99% of the ones I’ve seen are pure garbage, especially for someone like me (gluten-free, mostly casein-free diet). With that said, for years I’ve been on a search for a gluten-free bar with minimal sugar alcohols that tastes decent, at a reasonable cost, that simultaneously wasn’t filled with garbage ingredients (pure agave nectar or tons of other sugars). 1 – No gluten ~ Gluten for me is particularly bad and from what I’ve seen, at least half of my clients would be best served avoiding it, with the other half not really having any issue with it. Gluten sensitivity is generally not a good thing and has been linked with up to 150 separate and disparate issues ranging from canker sores to arthritis to bowel distress, fatigue, hypothyroidism and depression. In other words, one little protein (or actually peptide) can cause havoc throughout the body in lots of different ways. 2 – No casein protein – This is another issue for me as the enzyme that helps to break down gluten also helps break down casein. Have you ever met someone “addicted” to cheese? More than likely they are sensitive to casein and should probably stay away from it. Their “addiction” is actually an addiction and is caused by the incomplete breakdown of the casein protein which causes “caseo-morphine.” Similar in structure to morphine and makes you feel “happy and relaxed.” The issue is that the undigested portion means that it’s causing issues in your stomach and will generally have long-term health implications. (I used to think I could “NEVER” live without cheese). 3 – No Sugar Alcohols – Sugar alcohols have less calories than regular “sugar” (2 or 3 compared to 4 per gram as sugar), but still spike insulin and cause bowel distress. For me, I could probably get away with a bar, but every time I’ve had more than one (in consecutive days) I felt like I was getting stabbed in the gut (not a good time). 4 – No Soy Protein – If I’m going to spend money on a protein bar, I want to make sure that the protein is actually being absorbed by my body and utilized. Soy protein is not very good at that overall. I have other issues with processed soy, but for me, that’s the biggest issue with soy protein isolate. 5 – No artificial sweeteners – I don’t like sucralose or any of the other artificial sweeteners as they mess with brain chemistry and one thing that I’ve learned is that it’s easiest (and usually best) to avoid messing with brain chemistry. 6 – Not a lot of sugar – I hate pure agave nectar syrup and the fact that it’s touted as a health food. It’s over 90% fructose. High Fructose Corn Syrup is only 55-70% fructose and that’s not exactly touted as a “healthy food.” You see the issue with condensed fructose is that only your liver and kidneys can use the fructose for fuel with any excess usually being converted to triglycerides (aka, fat). Beyond that, other sources of sugar are usually hidden in these bars under different names – all equaling the same end. Too much sugar in a “protein” bar. 7 – Enough Protein to be considered a protein bar – Another pet peeve of mine is when something is supposed to be “high in protein” and has 9 grams of protein. That’s not high! To me, the minimum would have to be 20 grams for a bar to be considered a “protein” bar. I may not need 40 grams per bar, but I need at least 20. 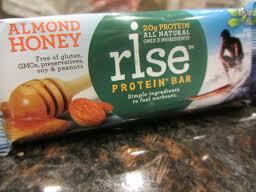 Rise Protein Bar – It has 3 ingredients – Almonds, Honey and Whey Protein Isolate. If you’ve read my article on Whey Protein, then you know I prefer Whey Protein isolate. Honey is relatively high in fructose, but the bar doesn’t seem to be inundated with an overwhelming amount of honey (and as a sweetener I think it’s one of the best options out there). Also, I almost always recommend that people eat some nuts with whey protein shakes as the shakes can spike insulin if not eaten with something that helps to blunt the insulin release. Therefore, this bar is one of the best bars I’ve seen on the market in years. The taste itself tastes like almond butter and at 280 calories is still considered a snack. The price on Amazon of $22 for 12 bars puts it at less than $2 per bar, which for a healthy snack is very cheap. Therefore, finally a protein bar I can recommend – Rise Protein Bar.